Columbia-MBF precision manufactured elbows are formulated of hot galvanized steel using a patented inline Flo-Coat process for extended exterior protection. 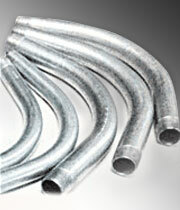 Our E-Z Pull interior coating provides a smooth raceway for fast and simple wire-pulling. Sizes 2-1/2 (63) and larger shipped in palletized cartons or bulk.